This desk consists of a green leather tooled top of inverted breakfront shape with curl mahogany banding with carved gadrooned edge below. This leads down to three drawers across the top, the central drawer being larger and leading down to a pedestal either side, each having three drawers, all the small drawers having recessed panels to the sides. The drawer fronts all of fine quality curl mahogany veneer, mahogany cockbeads and mahogany linings with original brass swan neck handles. Below the top to both the sides and back the frieze panel is of fine curl mahogany leading down to the pedestals with solid curl mahogany panels to the sides and back and also to the inside of the pedestals. 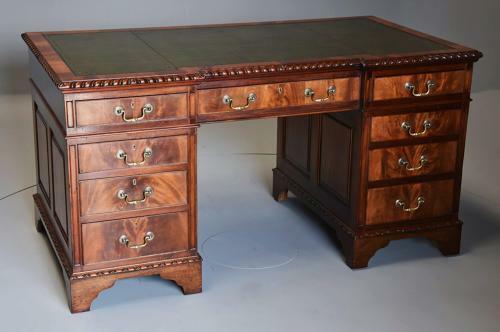 The base has a carved egg and dart moulding to the edge and the desk is supported by bracket feet. This desk is in excellent condition for age, is of stable construction and can go straight into a home. Please note: the chair in the photographs are not included in the price, please contact me for further information if required.